Have been coming to this pub off and on for over twenty years and like some of the posters below, I remember well the days when it sold huge, rare, roast beef baguettes carved straight from a massive rib. That's long gone but many other things remain very familiar. So, paid a visit a couple of weeks ago for the first time in about a year - packed outside as always but some standing space inside was quickly found. I and a friend had a few pints of Youngs Bitter and it went down very nicely, a couple of other mates were on the lager and said it was good! Perennial problem is the upstairs gents - tiny and often smelly. On this visit the pong was so bad I actually gagged when walking in. Its hard to see what they can do given the age and shape of the building and the fact that the place has far more customers than the bogs can cope with. Nonetheless, an enjoyable visit to a vertical drinking pub, where despite the 'crowd' service is good! 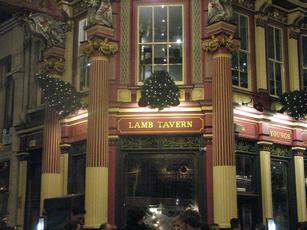 Beautiful location in Leadenhall market even if the market long ago ceased to be anything other than a tourist trap. Beers are from the Youngs and Wells range and not especially illuminating. There is a curiously bijou upstairs bar which has elements of cosiness. In warmer weather the suited denizens spill out into the market's communal areas. 2 young bar staff on with both of them seemingly wanting to spend time talking to their friends than serving new punters, after a short wait and a few eyes towards one of the said bar person’s I choose a pint of Young's Winter Warmer from the 3 ales on the hand pumps, London Gold & Young’s Bitter being the other 2 choices. It was raining outside and was also pretty cold so a Winter Warmer also takes the chill’s away however not when it’s served in a freezing cold glass! It was like holding a glass full of ice, making what is normally a warm hearty ale very cold like generic lager!! Music playing at a higher than average level, I guess the bar staff thought this was appropriate as the place was only a quarter full. The interior of this bar is amazing and is worth a visit just for that alone. Having visited the Lamb over 5 years ago last, I returned to take in Old Tom's Bar, which is in the basement of this establishment. Whilst the Lamb itself was packed on my late Friday afternoon visit with many spilling out into the market itself, few manage to spot the narrow entrance, including myself. 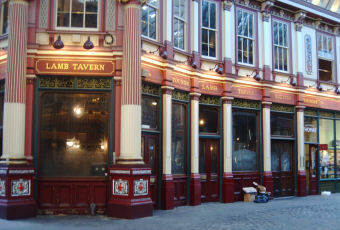 I eventually went into the Lamb to find out where the entrance to Old Tom's Bar actually was. The bar was much quieter and I easily secured a table. The look and feel is of an old butchers premises with white tiled walls and meat hanging over the bar. Sharps Coaster & Youngs Ordinary & London Gold were on offer. I plumped for Aspalls. Complimentary sausage rolls were on the bar. It's well worth knowing about Old Tom's Bar, if you're looking for something a bit more peaceful. I assume the ales are the same as in the Lamb upstairs. Only open during the week. This pub gets extremely busy and the crowd spills into the courtyard. Due to the numbers, the toilets become disgusting as they are not designed for so many people. There was a queue outside both ladies and gents toilet last night. Maybe a Public Health inspector should drop in one busy evening. If I'm paying top wack for beverages, I expect a clean bathroom.